We’ve starting booking stalls for 2014. If you have any questions please email: manchester@bookfair.org.uk. Stalls are subject to change so please contact stalls directly if you have any questions. 0161 Festival is an anti-fascist festival that will be held in Manchester, England on the 2/3/4 May 2014 over three different stages. We distribute “all things anarchist” as cheap as we can including material from Haven and Freedom Press. Artwork produced by Joey Mutant from dissident-anarcho-space-punk band Black Light Mutants. Using a mixture of traditional painted work as well as digital manipulation to put the works together Joey creates depictions and imagery based on the bands music, sounds and lyrics creating the menacing and dark world of an imaginary post apocalyptic Manchester, but within the squalour and desolation there is a story of love, hope and togetherness. collective running of the organisation. people through public talks, meetings and texts. Critisticuffs is based in London. A small imprint publishing existing and new articles around green anarchism with the aim of informing and creating debates. Promoting ethical and healthy living; vegan, ecological, organic, fairtrade, equality, global issues etc. Brief description: Leeds based anti-capitalist printers who’ve started doing a distro of some of their favourite stuff that they print. Paper drawing on the best traditions of both anarchist-communism and Dutch/German and Italian left communists. We are a DIY literary zine that collects writing and illustration from around the UK, trying to give a voice to many people with opinions and beliefs that are shunned or undervalued by a lot of the mainstream literary journals and magazines. We present it as an anarchist zine, but as long as people have an interesting idea we will put it in there. The IWW is a revolutionary global union for all workers, including students and the unemployed. In recent years, the IWW has organised John Lewis Cleaners and Pizza Hut Workers within the UK, and Starbucks and other fast food chains in the US. We fight for better conditions today, and economic democracy tomorrow. LIES attacks the legacy of racism and transphobia that has plagued feminist organizing and strives to develop new ways of making autonomous feminist practices today that take pointed and militant attacks on white supremacy and transphobia as essential parts of feminist struggle. Liverpool local of the Solidarity Federation, an anarcho-syndicalist union initiative and the British section of the International Workers Association. Manchester Animal Action campaigns locally against all forms of animal exploitation. These activities can range from promoting veganism to holding demonstrations against animal circuses to travelling to larger national events. Manchester Climate Action is a direct action group which formed in 2007.
supporting residents resist airport expansion and peat bog extraction as well as opposing fracking on Chat Moss, Salford. There has been a growing need for a radical community hub in the years since Manchester’s last social centre, The Basement, was closed due to flooding. Manchester Social Centre aims to fill this void by reclaiming space and services within the city and turning it into a ‘corporate free’ sanctuary for the community. We want to create a space for local activity and interaction, enabling groups to hold meetings and events at low cost, for members to share resources, develop and form links with other groups, and providing an accessible means for the people of Manchester to unite and share in positive radicalism. Part of the UK Zapatista Solidarity Network. Since the Uprising of the Zapatista National Liberation Army in 1994, the Chiapas Zapatistas have become an inspiration to many groups concerned with Global Justice and radical democracy. In resistance to constant paramilitary pressure they have built up autonomous structures in Zapatista territory in Chiapas. MZS supports other Zapatista groups in the UK with fundraising for autonomous water, health and education projects, and runs workshop on Zapatista thought and practice. The stall has books on and writings by the Zapatistas, documentaries, the Zapatista Solidarity calendar 2014, and a Zapatista solidarity 2014 diary. Nolletti’s relationship with photography came out by chance. It is the music to be at the centre of his formation and his creativity. new situations, often far away from him. The photography is, like the music, for Massimo Nolletti the possibility to enter in contact with the vibrations which the world contains. We are a group of lawyers, students and activists fighting to save legal aid to secure justice to everyone – we are fighting together to save criminal and civil legal aid, and hope you can join us! Fifth issue of the journal by the anarchist collective Occupied London. Illustrations by Leandros. Publishers of greetings cards, postcards and posters using images from the history of the labour movement. Plan C MCR is one of the four groups in Plan C (the others are Leeds, London and Thames Valley). We are currently organising around anti-work and anti-national politics as well planning a series of discussions in the new year around the concept of the future. As well as working on UK politics we are busy building European contacts in Germany and Greece. If you are interested in getting involved, telling us about your project or just finding out a little more then please let us know. Small DIY label & distro which helps fund community projects and radical causes. UK-based journal of socialist and feminist philosophy, the first issue of which appeared in January 1972. The journal is run by an Editorial Collective and appears 6 times a year. It features major academic articles by some of the most famous writers in contemporary left-wing and feminist philosophical, political and cultural thought, including Alain Badiou, Étienne Balibar, Pierre Bourdieu, Judith Butler, Paul Virilio and Slavoj Žižek. A network of independent cooperatives working for Radical Social Change. Red Pepper is a bi-monthly magazine and website of left politics and culture. We’re a socialist publication drawing on feminist, green and libertarian politics. We seek to be a space for debate on the left, a resource for movements for social justice, and a home for anyone who wants to see a world based on equality, meaningful democracy and freedom. A magazine that promotes co-operative and community-led political alternatives taking place outside of the market and state. In October we publish our third issue on the future of money. STRIKE! is a radical, quarterly newspaper – we deal in politics, philosophy, art, subversion and sedition. Each issue we gather together a group of high-grade artists and authors, give them a theme, and let them get creative with it. It’s a magazine, it’s a journal, it’s a carnival. Vegan Catering, Cafe and Cakes! We will have our usual stall at the book fair with excessive amounts of cake and other vegan treats! Tea Jamboree provices a playful tea experience where you can concoct a cuppa to suit your mood! Come along and explore the selection of teas, flowers, spices, herbs and fruit, and enjoy your unique cup of tea. Try something new and unleash your creativity! Anarchy On The Airwaves. Manchester’s radical radio show brodcasts every Thursday from 11.00pm-1.00am on community radio station ALL FM 96.9 across south, central and east Manchester and online at http://www.allfm.org. HELP! WAST (Women Asylum Seekers Together) are trying to collect toys, sweets etc for 40 children of refugees and asylum seekers this Christmas. If you want to help you can bring along any donations and drop off at the WAST stall. Stuff needs to be new and suitable for babies right through to 14 year olds. 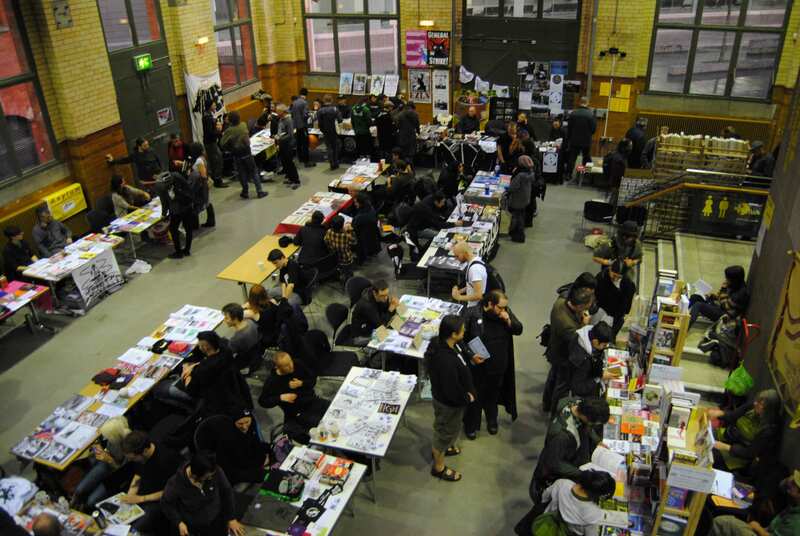 Please note: This is an anarchist bookfair. I would agree with the decision of the organisers of the bookfair to allow the IBMT to have a stall. My reasoning is that although the IBMT is not an anarchist organisation, members of the IBMT in Manchester, such as Charles Jepson, Dolores Wild and Hilary Jones, assisted in the production and sale of a Spanish Civil War pamphlet produced by Tameside TUC in 2006. Without the help of the IBMT in Manchester, and especially the people mentioned, the sales of our booklet which now totals over 3,000 may have not have been so successful. The Tameside TUC Spanish Civil War booklet has a picture of Durruti on the front and gives a balanced history of that struggle giving full credit to the anarchist for their role in that struggle. The International Brigade Memorial Trust are welcomed by anarchists at their event? Have you looked into who they are and what happened in Spain? If the IBMT is an anti-anarchist organisation I’d be interested in finding out more. I’d like to come to the bookfair: i’m disabled – do you mind if i bring my dog? She assists me but i don’t exploit her, it’s more a mutual aid arrangement. I’ve emailed reply to this. I dont see anything about the elations between anarchism and sharia law, so i am williong to fill the gap ! i think it is vital to raise awareness of sharia law and how it links with fascism. Just to be a point for discussion if any one would like to. I could have some art work depicting some aspects of sharia law.